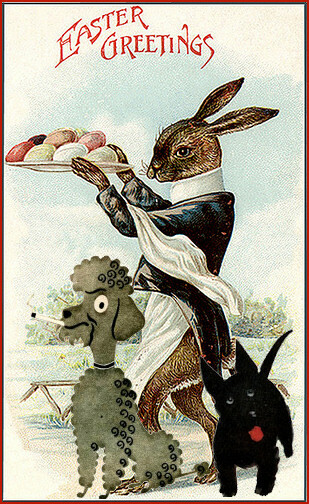 Happy Easter and Happy Passover to those of you who observe these holidays, and a regular happy weekend to everybody else! I got a bunny-shaped dog biscuit. To show my gratitude, I’ve spent this afternoon cooking rhubarb compote (with honey, vanilla, a hint of almond and cream. Bliss…) for tomorrow’s Easter meal. What can I say – I wasn’t too keen on leftovers, and the cats can’t cook. But you probably neither care about dog biscuits nor rhubarb compote (peasants! ), so here’s some Jack Davenport news. While filming “Smash” in New York, somebody cornered him (hopefully without the use of comfy chairs and soft pillows) and made a video. Journalist Brittany Frederick talks about her job and how, among other things, she got to interview Jack Davenport. Only took her ten years! I knew I’d love to interview him. And, so, the great quest of my career was born. The obvious obstacle was that pesky thing called the Atlantic Ocean. Davenport is British, and resides in the United Kingdom, so that put a huge damper on my hopes of meeting him for a long time. Cash before Smash, though: we’re very happy to inform you that our contribution to the help_japan auction on Livejournal (you could bid on a “Little Box O’Switzerland”) raised an amazing $ 150.00 for Doctors Without Borders! Woohoo and woof for the generous donour! The Facebook-poll has come to an end, and 59.09% of our readers decided that Goodboy, Sparky! doesn’t need to be on Facebook. Thanks a lot for your participation; we’ll happily stay away from FB. And now once again for something completely different: filming for “Smash” is well on the way, and we finally get to see pictures of Jack Davenport. And not only is he looking rather dashing, if I may say so, no, he’s also in the excellent company of Anjelica Huston. We always knew he was smashin' - Jack Davenport in "Smash"